Please note that the content of this book primarily consists of articles available from Wikipedia or other free sources online. Dr. Abdul Malik Al-Jaber is a Palestinian businessman. He is CEO of Zain Jordan, the country's leading telecommunications provider, and is a member of the board of the World Economic Forum. 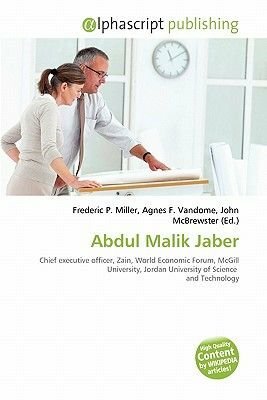 Al-Jaber is a graduate of Jordan University of Science and Technology, McGill University in Canada, the Northwestern University-Kellogg School of Business Administration in Chicago, and the International School of Management in Paris. He holds a DBA, MBA as well as an MSc and PhD in Engineering.